In the last week or so I've been honoured to within an inch of my life. First I got a rave review in Lime&Violet! Crochetcompulsiv crept up behind me and wrote about me without telling me about it. She calls it "stealth admiration", so I'm warning all you crocheters that she is on the move and nobody is safe. Then I received an over-the-top compliment from Kathy Merrick, the brilliant designer of the Babette Blanket - not to mention all the totally over-the top compliments from many brilliant crocheters and knitters! 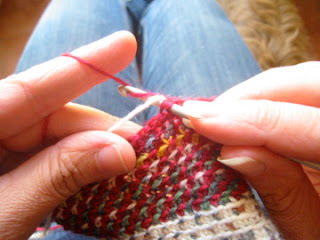 Then I discovered a mention on another awesome site called Craft & Found. So here's me squee-ing all over the house and trying to decide how to return some of the goodness that's just been poured on me by the crochet community. 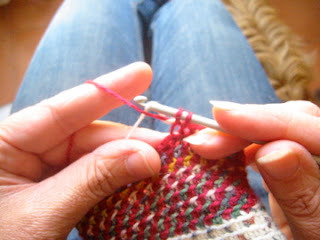 The result is this tutorial, since I think a lot of crocheters are becoming interested in Jacquard technique. 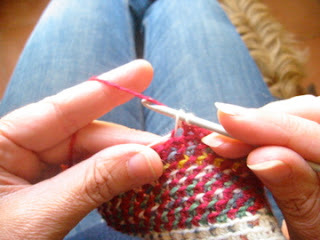 It's already published in Spanish along with the pattern for Bernat de Ventadorn on Tejemanejes. So this is the English version. I used to get into the most horrendous tangles before I started working this way. OK, let's not write up any more laudatory reviews of Lara Croft, guys. It goes right to her head. Look at this post. What was I thinking? Like, did I invent this technique? No. In the state of self-exaltation you guys left me in, I omitted to mention that I learned it from another blog. Whose blog? Why, whose do you think? Carol Ventura's blog, of course! To see where I learned this choreography, go to this page. 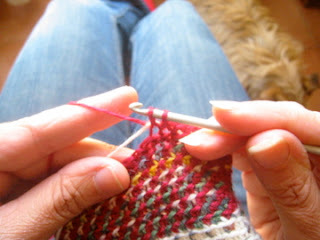 My crocheting life is divided into a Before and After Carol's page on Tapestry Crochet in Finland! 1. Let's call red A and white B. Hold A in the normal manner, and B flat over the top of the work. 2. 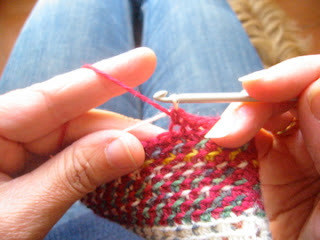 Insert hook in Back Loop of stitch. Pass hook under B and pick up A. 3. Draw through a loop. 5. ...and pick up B. 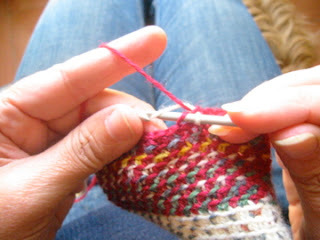 6. and pull B through, completing the stitch. and pick up B from where it's lying over top of the work. 9. 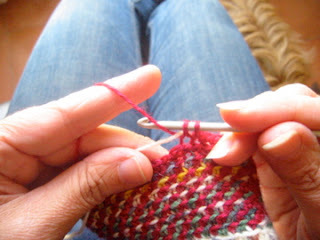 And pull it through, completing the stitch. Now you can start all over from the beginning! 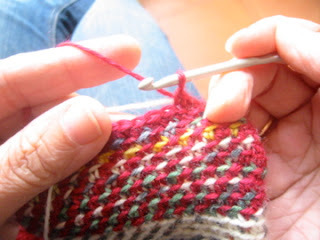 I find that if I have to do a longer stretch (more than 3 sts) of colour B, it's more graceful to drop both strands and pick them up again with their positions reversed. The strand you hold in the normal manner is faster for most of us to work. Doggy is optional but happy. Felicidades ¡guapa! te echo de menos en BK. That is so cool! Thanks for the tutorial. Thanks for the tutorial, I'll have to try that soon. And if those don't make it into the book, I don't know what will. What can I say...thank you, I love you, you simplified it beautifully!! Ae: no back or front here! This only works in rounds, so there's a Right Side and a Wrong Side, which is hopefully not seen! Congrats and thanks for the tutorial.